No other place is going to have as much sugar available as Sweets N Treats. Located on the Main Midway by the main entrance, it is a perfect spot to get the first taste of fun after riding the carousel. Not looking for a sugar rush in the morning? 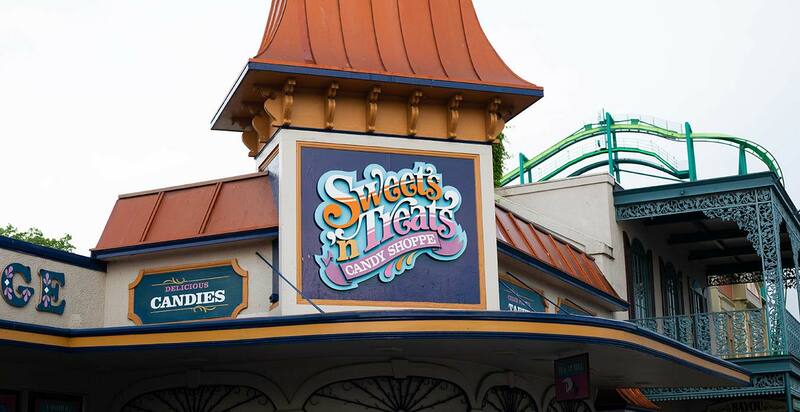 Finish the trip off with something sweet by stopping by on the way home for a dessert after conquering all the rides. It’s not an amusement park without popcorn and cotton candy to snack on. Try an elephant ear topped with cinnamon and sugar that is bigger than the plate it’s served on. Get some salt water taffy for a classic coastal souvenir for the trip home. Fudge of multiple flavors is sure to satisfy any chocolate lover’s dream. Pair it with a soft pretzel for the perfect sweet and salty combo. With so many choices, there is something for everyone. Snack on whatever sweet treat your heart desires!